Installation directly to the surface or installation to the frame are two main methods for mounting drywall to the surface. The carcass method doesn’t suite the small premises because the frame takes up the space of the room and reduces it. 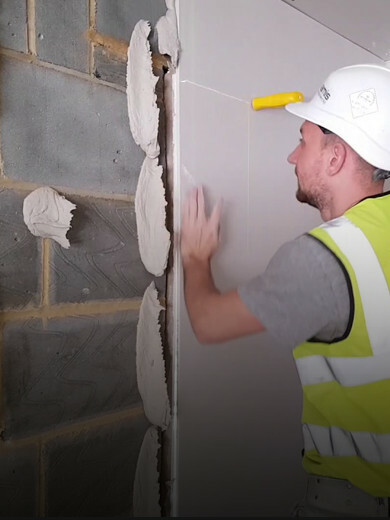 Dot and dab technology is used for the frameless method of plasterboard installation to the surface. It consists in fixing boards to the surface with a special glue. The frameless mounting method has many advantages such as speed, economy and simplicity. Also, by doing Dot and dab additional space is not wasted as in case of frame mounting. As a result the wall is more durable, without the cracks formation in the future. Therefore, this type of mounting is preferable if possible. However, this type of proceeding is not suitable for all surfaces. The technology provides for fixing it to the bricks and concrete only. The main condition of application is the wall evenness which is not always presents. In addition, it is more difficult to hide necessary communications behind the pasted plasterboard. Another drawback is the limitation of the height of the structure, which is of three meters maximum. To the basic requirements of the state of the surface is not only evenness. It should be complete and solid, without condensation or freezing, without any kind of deflections, protected from high humidity, don’t crumble. Depending on the state of the surface there are three main ways of Dot and dab. With a insignificant roughness up to 4 mm, putty plaster is applied in the middle and along the edges of the plates. When up to 20 mm curvature of the walls a special glue is used, withstanding special requirements for distance and technique of its application. In the case of coating errors up to 4 cm, a two-stage method is used. At first, the narrow ten-centimetric strips are glued and then a layer of solid boards is laid. A special mounting glue Perlfix and universal Fugenfuller putty by the German company Knauf Gips KG are mainly used. Both materials are suitable for interior work, including for bonding the drywall. The basis of mounting glue Perlfix is a natural gypsum material and additional polymeric substances. Fugenfuller dries quickly and after drying it becomes durable and stable, does not form cracks. It consists of environmentally friendly materials that are harmless to human health and life. Generally, Fugenfuller is used when sealing gypsum plaster joints and Perlfix glue is intended for gluing drywall to the surface. It is also environmentally friendly for both human health and the environment. Quick and strong grasping, which occurs in a matter of minutes, is an indisputable advantage. In addition, during the preparation and application of the mixture, unwanted clods are not formed. However, compared to Fugenfuller putty, Perlfix mounting glue freezes longer.